It was the work that was said to have inspired a young Pina Bausch, spurring her on to the choreographic path that had such impact upon the world of dance. Anna Sokolow’s Odes is a masterpiece from an age filled with change and contradiction. It was created in 1965 and premiered at the Julliard Theater in New York City that same year. The performance at the Merce Cunningham Studio by the Sokolow Theatre/Dance Ensemble November 10th thru November 13th was the first time the Odes had been seen in New York since 1968. The actually performance of the piece began with a little seen film from the archives of Anna Sokolow. 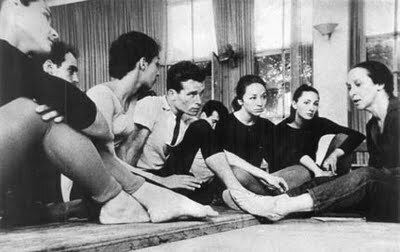 Ms. Sokolow is seen in rehearsal for the setting of the dance on the Ohio State Dance Group in 1966. We are assaulted by the force of nature that was Ms. Sokolow. She seemed a no-nonsense woman who sought the truth of movement in her dancers as paramount to the expression of her work. She is a demanding director, who as an expressionist was not afraid to try odd and sometimes frantic shapes to make her point. She stresses the importance of emotional imagery as vital to the “truths” she found so necessary for a dancer to be found believable. The Sokolow Theatre/Dance Ensemble in "Odes"
When the 20 minute film finished 23 dancers came onto the stage and we were witness to the genius of her creative vision. 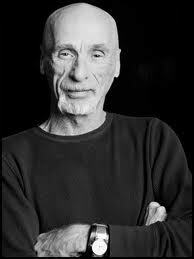 Odes deserves it proper place within the history of dance. One may see the piece today and say that it is reminiscent of bits and pieces of other dances seen in recent decades, but one must remember that Odes was created in 1965 when modern dance was still defining and demanding it place within the pantheon of what is called art! It is a strong work and just as a true great piece of art is has an element of timeliness. 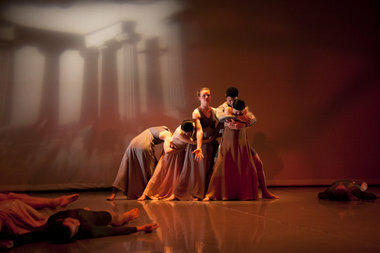 The dance is inspired by the legends of ancient Greece. 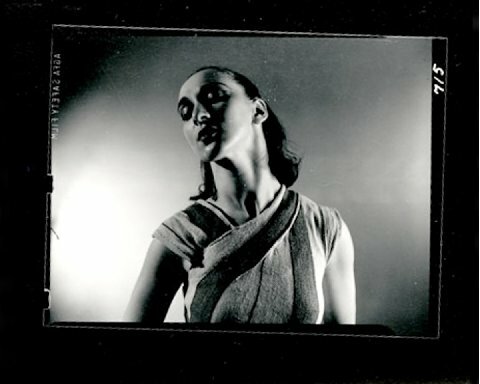 It is not a literal telling of a hero or myth as in the work Martha Graham with whom Ms. Sokolow started her professional career in 1929. But there is much evidence of the influence of Ms. Graham. Ms. Sokolow’s vocabulary is more abstract in nature. into a mass of bodies; a spree of emotional seeking that builds in intensity and commitment. It is in the third section, Closing: Poème Électronique that we see the truth of commitment that Ms. Sokolow spoke of in the film. The group moves as one, seated on the floor, head bowed, arms switching in an instant from slow hypnotic movements to an intense moments of staccato unexpectedness They stand and with inverted torso they backbend towards the audience so we get an unnerving visual of upside downs faces, facing us, staring out as if victims within some twisted and macabre version of child’s play. “Odes” is psychological in make-up in that it is at times unnerving but at all times arresting. Odes is set to the music, “Poème électronique” (Electronic Poem), which was composed in 1958 by Edgard Varèse, the father of electronic music, and Iannis Xénakis, one of the most important modernist composers of the 20th century, under the direction of Le Corbusier, one of the most important architects of the 20th century. Some may argue that the musical score is somewhat dated, that is does not show the sophistication, and one reviewer referred to it as a “pioneering work that now sounds like Space Age flatulence“. But again, it must be seen within the historical landscape to which it exists. To discount Varèse’s “Poème Électronique is to me, akin to discounting the importance of such a work as Philip Glass’s Two Pages (1968), a piece from the same time period and widely recognized for its brilliance. 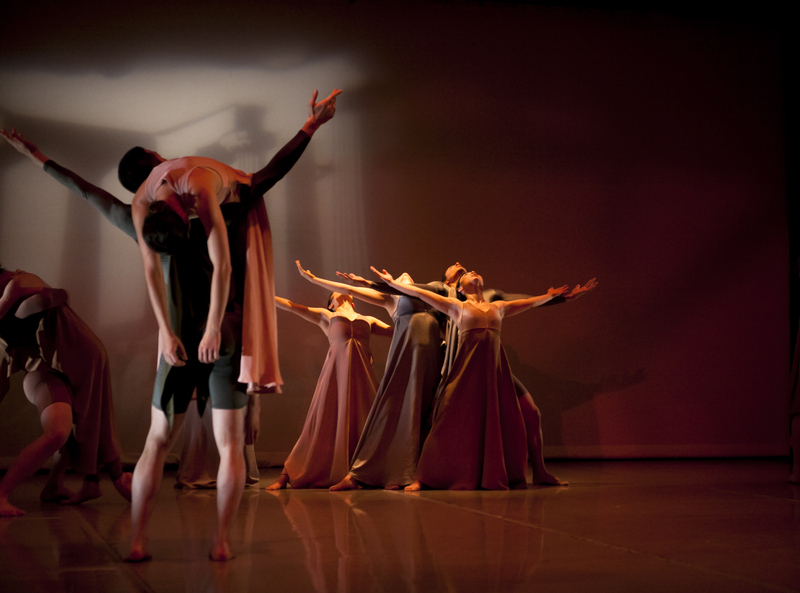 I must mention Jim May’s solo Passage (2009) choreographed and danced by Mr. May who is the company’s artistic director. This is a work emotional charged, both salient and haunting. Mr. May takes an inward journey of soulful expression that seems of great loss and at times tumultuous that was masterful. His focus and the emotional truth stressed were true to the tenets of Anna Sokolow. The score for the piece was Sergei Rachmaninoff’s; Preludes for the Piano, Op. 23: No. 1 in F sharp minor performed by Amir Khosrowpour. Two Preludes, a solo choreographed by Sokolow in 1985 for Evelyn Shepard and danced by Melissa Birnbaum gave us a view of her work that was more recent but still possessed Ms. Sokolow’s signature. My least favorite work of the evening was At the Still Point of the Turning World, choreographed by Ernestine Stodelle in 1975 and danced by Lauren Naslund while Mr. May recited T. S. Eliot. I did not find the piece to be of the same caliber to stand besides the work of either Anna Sokolow or Jim May. In 1991, Anna Kisselgoff summed up Sokolow’s aesthetic as “American Expressionism,” and commented that “Stillness is a large part of her choreography, and Miss Sokolow can sum up a state of being — an entire society — in an arrested pose. Sokolow Theatre/Dance Ensemble is a company of dancers, presently under the artistic directorship of long-time Sokolow associate, Jim May. Their aim is to recreate works choreographed by Anna Sokolow, continue her teachings, and develop her artistic vision for the purpose of passing on for posterity Anna Sokolow’s lifetime efforts to combine the arts of theatre, dance, music and painting.